Clark's Trading Post and the White Mt. Central RR in Lincoln, NH are proud to host a Cub Scout Adventure Day. Members from the US Forest Service will be teaming up to bring Cub Scouts information at three learning stations. At 1:00 the Forest Service members will have specialists to present three 25-minute segments on Geology, Bear Awareness and Leave No Trace (which includes Hike Safe and Tree Identification). The presentations will end with a ceremony where each Cub Scout will receive two patches and a pin from the US Forest Service. Scouts need register online to participate in the Junior Ranger Program. 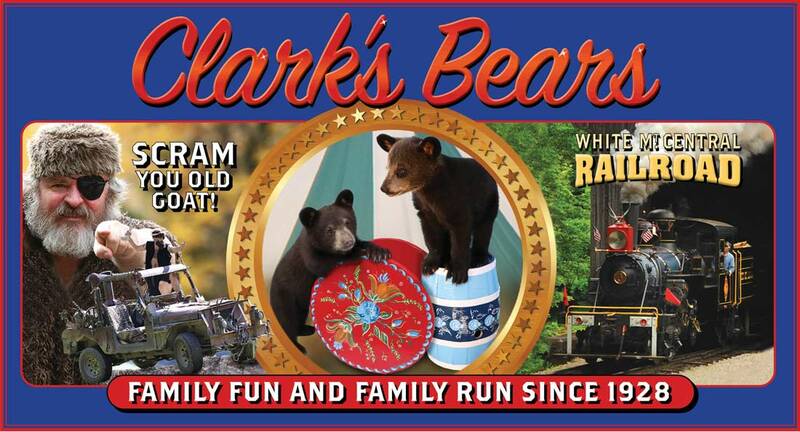 The registration fee includes the Junior Ranger Program as well as all the rides and shows that Clark's has to offer. There are discounts throughout the park for Scouts in uniform. A special Clark's Trading Post Scouting patch will be on sale to remember your day. Presentations will begin at the Scouting Tent and will have a limited amount of seating, so register early to reserve your spot. COST - The cost is $20 per person, which includes both the Junior Ranger Program and entrance into the Clark's Trading Post Theme Park. Your ticket includes all rides, all shows, all day. FAMILY MEMBERS - The Scout's family is welcome to visit Clark's as well, but only Scouts and Leader (or a parent) are allowed into the presentation. Family members ages 4 and above will receive the $20 rate per person but they must be included in the registration. CHECK-IN - Scouts and their family must check-in at the Anaconda Escape (water raft-ride) Gate from 9:30-10:30. At this time they will receive their tickets, a hand stamp and the schedule for the day. Members from the US Forest Service will be working with Cub Scouts presenting three 25-minute segments on Geology, Bear Awareness and Leave No Trace (which includes Hike Safe and Tree Identification). The presentations will end with a ceremony where each Cub Scout will receive two patches and a pin from the US Forest Service. 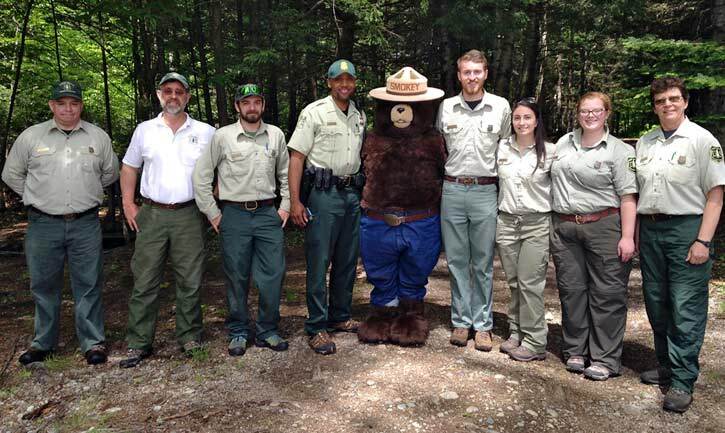 US Forest Rangers team up with Smokey Bear to bring Cub Scouts a Junior Ranger program. UNIFORM - Class 'A' uniforms are preferred for this event. FOOD - Lunch, drinks and snacks are available for purchase at Clark's. You may also choose to bring a bagged lunch if you so desire. QUESTIONS - If you have questions the best way to reach me is to email Anne Englert at info@ClarksTradingPost.com or call 603-745-8913 Extension 19. Special discounts around the park for Scouts in uniform.